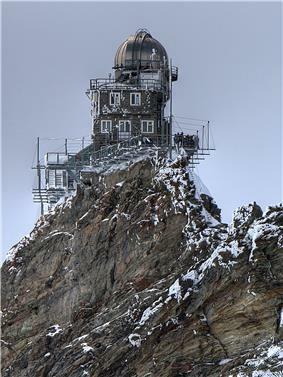 The Sphinx Observatory at the Jungfraujoch in the Swiss Alps; high altitude observatories are less affected by the atmosphere. 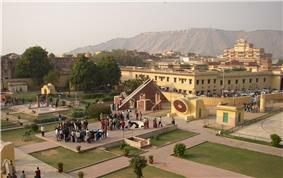 An observatory is a location used for observing terrestrial or celestial events. 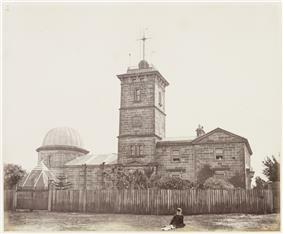 Astronomy, climatology/meteorology, geology, oceanography and volcanology are examples of disciplines for which observatories have been constructed. Historically, observatories were as simple as containing an astronomical sextant (for measuring the distance between stars) or Stonehenge (which has some alignments on astronomical phenomena). Paranal Observatory, home of the Very Large Telescope, a cluster of four large (8.2 meter diameter) telescopes. For optical telescopes, most ground-based observatories are located far from major centers of population, to avoid the effects of light pollution. The ideal locations for modern observatories are sites that have dark skies, a large percentage of clear nights per year, dry air, and are at high elevations. At high elevations, the Earth's atmosphere is thinner thereby minimizing the effects of atmospheric turbulence and resulting in better astronomical "seeing". Sites that meet the above criteria for modern observatories include the southwestern United States, Hawaii, Canary Islands, the Andes, and high mountains in Mexico such as Sierra Negra. Major optical observatories include Mauna Kea Observatory and Kitt Peak National Observatory in the USA, Roque de los Muchachos Observatory in Spain, and Paranal Observatory in Chile. Specific research study performed in 2009 shows that the best possible location for ground-based observatory on Earth is Ridge A – a place in the central part of Eastern Antarctica. This location provides the least atmospheric disturbances and best visibility. Panoramic view of the Chajnantor Plateau shows the site of the Atacama Large Millimeter Array. Beginning in 1930s, radio telescopes have been built for use in the field of radio astronomy to observe the Universe in the radio portion of the electromagnetic spectrum. Such an instrument, or collection of instruments, with supporting facilities such as control centres, visitor housing, data reduction centers, and/or maintenance facilities are called radio observatories. Radio observatories are similarly located far from major population centers to avoid electromagnetic interference (EMI) from radio, TV, radar, and other EMI emitting devices, but unlike optical observatories, radio observatories can be placed in valleys for further EMI shielding. Some of the world's major radio observatories include the Socorro, in New Mexico, USA, Jodrell Bank in the UK, Arecibo, Puerto Rico, Parkes in New South Wales, Australia and Chajnantor in Chile. 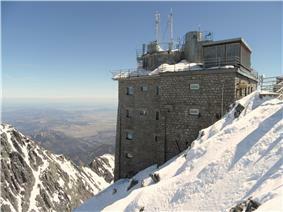 Since the mid-20th century, a number of astronomical observatories have been constructed at very high altitudes, above 4000–5000 m (13,000-16,000 ft). The largest and most notable of these is the Mauna Kea Observatory, located near the summit of a 4205 m (13,796 ft) volcano in Hawaii. The Chacaltaya Astrophysical Observatory in Bolivia, at 5230 m (17,160 ft), was the world's highest permanent astronomical observatory from the time of its construction during the 1940s until 2009. It has now been surpassed by the new University of Tokyo Atacama Observatory, an optical-infrared telescope on a remote 5640 m (18,500 ft) mountaintop in the Atacama Desert of Chile. "El Caracol" observatory temple at Chichen Itza, Mexico. Remains of the Maragheh observatory now under a modern protective dome at Maragheh, Iran. Space-based observatories are telescopes or other instruments that are located in outer space, many in orbit around the Earth. Space-based observatories can be used to observe astronomical objects at wavelengths of the electromagnetic spectrum that cannot penetrate the Earth's atmosphere and are thus impossible to observe using ground-based telescopes. The Earth's atmosphere is opaque to ultraviolet radiation, X-rays, and gamma rays and is partially opaque to infrared radiation so observations in these portions of the electromagnetic spectrum are best carried out from a location above the atmosphere of our planet. Another advantage of space-based telescopes is that, because of their location above the Earth's atmosphere, their images are free from the effects of atmospheric turbulence that plague ground-based observations. As a result, the angular resolution of space telescopes such as the Hubble Space Telescope is often much smaller than a ground-based telescope with a similar aperture. However, all these advantages do come with a price. Space telescopes are much more expensive to build than ground-based telescopes. Due to their location, space telescopes are also extremely difficult to maintain. 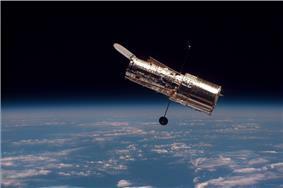 The Hubble Space Telescope was serviced by the Space Shuttle while many other space telescopes cannot be serviced at all. Airborne observatories have the advantage of height over ground installations, putting them above most of the Earth's atmosphere. But they also have an advantage over space telescopes – the instruments can be deployed, repaired, updated much more quickly and inexpensively. The Kuiper Airborne Observatory and the Stratospheric Observatory for Infrared Astronomy use airplanes to observe in the infrared, which is absorbed by water vapor in the atmosphere. Balloons for X-ray astronomy have been used in a variety of countries. ^ Chaisson, Eric; McMillan, Steve (2002). Astronomy Today, Fourth Edition. ^ Saunders, Will; Lawrence, Jon S.; Storey, John W. V.; Ashley, Michael C. B.; Kato, Seiji; Minnis, Patrick; Winker, David M.; Liu, Guiping & Kulesa, Craig (2009). "Where Is the Best Site on Earth? Domes A, B, C, and F, and Ridges A and B". Publications of the Astronomical Society of the Pacific 121 (883): 976–992. ^ "ALMA’s Solitude". Picture of the Week. ESO. Retrieved 26 December 2012. ^ Zanini, A.; Storini, M.; Saavedra, O. (2009). "Cosmic rays at High Mountain Observatories". Advances in Space Research 44 (10): 1160–1165. ^ Yoshii, Yuzuru; et al (Aug 11, 2009). "The 1m telescope at the Atacama Observatory has Started Scientific Operation, detecting the Hydrogen Emission Line from the Galactic Center in the Infrared Light". Press Release. School of Science, the University of Tokyo. Retrieved 21 December 2009. 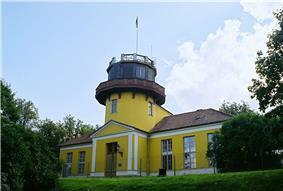 ^ "Facts about Hipparchus: astronomical observatory, as discussed in astronomical observatory:". Encyclopædia Britannica. ^ Micheau, Francoise. pp. 992–3. , in Rashed, Roshdi; Morelon, Régis (1996). ^ Kennedy, Edward S. (1962). "Review: The Observatory in Islam and Its Place in the General History of the Observatory by Aydin Sayili". ^ "Real Observatorio de Madrid - Breve semblanza histórica". ^ "National Park Service: Astronomy and Astrophysics (United States Naval Observatory)". Cr.nps.gov. 2001-11-05. Retrieved 2011-11-03. ^ Portolano, M. (2000). "John Quincy Adams's Rhetorical Crusade for Astronomy". Isis 91 (3): 480–503. Aubin, David, Charlotte Bigg, and H. Otto Sibum, eds. The Heavens on Earth: Observatories and Astronomy in Nineteenth-Century Science and Culture (Duke University Press; 2010) 384 pages; Topics include astronomy as military science in Sweden, the Pulkovo Observatory in the Russia of Czar Nicholas I, and physics and the astronomical community in late 19th-century America.